All attacks fall into four basic categories: Melee, Ranged, Force, and Tech. In actuality, depending on what class you are playing, you only have to worry about two at a time. Your class is either a Jedi/Sith class, in which case you use Melee and Force, or your class is a Trooper/Bounty Hunter or a Smuggler/Agent, in which case, you will be using Ranged and Tech. 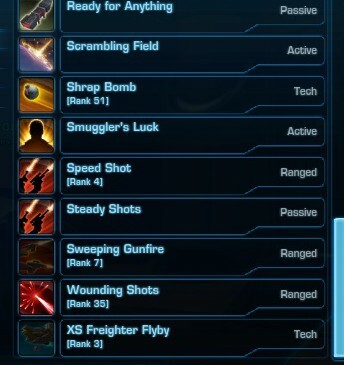 You can tell which skills are which type by opening your skill panel and looking at the text next to each skill. If it doesn’t say Active or Passive (which are just general skills and buffs), it will say the type of attack it is. Ranged and Melee attacks are always at risk of being shielded, but Tech and Force are only sometimes shielded, depending on the Damage Type. Further dividing the skills are the Damage Types of each. Damage Type doesn’t actually line up with the classes the way Attack Type does. There are four Damage Types: Energy, Kinetic, Internal, and Elemental. Really, there are only three types in practice, as Elemental and Internal are really just aesthetic, theme-based damage that come from DoTs, fire-based attacks, and other special, spec-based attacks. I’ll usually refer to them as Internal/Elemental. The Damage Type for each skill is listed on the skill’s tooltip. Energy typically goes with Melee and Ranged attacks (anything that says “Weapon damage” means Energy), Kinetic typically goes with Tech and Force, and Internal/Elemental typically goes with Tech and Force. I say “typically” because there are examples of crossover, such as the Gunslinger’s Shock Charge, which is Tech, but does Energy damage or the Sentinel’s Clashing Blast, which is a Force attack, but does Energy damage. Also, Internal/Elemental damage can be applied as a DoT from a number of Melee and Ranged attacks, but the direct application of DoTs typically falls under the realm of Tech and Force attacks. One important thing to understand about the Damage Types is how they interact with armor. Energy and Kinetic damage is mitigated with armor, whereas Internal and Elemental attacks are not. Another important distinction comes with how shielding works. Tanks can shield against all Ranged and Melee attacks, and all Tech and Force attacks that deal Kinetic or Energy damage. Internal/Elemental damage is exempt from shielding. With the Update 3.0 came new debuffs for each of the classes, especially for the DPS specs. This was for a number of reasons, but perhaps the most obvious reason was the fact that stacking the same class in an Ops group is no longer optimal (here is looking at you, Gunslingers). Some of the debuffs already existed in one form or another, but now they have been standardized in values and names. This is a good thing, as it makes it so players can plan their damage more consistently, multiple classes have similar debuffs and so can be swapped out, and they can’t stack the same effect in a FOTM style (meaning that developers can more easily balance content). I will try to summarize the debuffs, what they do, who has them, etc. Trauma (-20% healing received) still exists with Gunslingers/Snipers and Sentinels/Marauders in all specs (although the latter had it moved from the now-defunct Crippling Throw/Deadly Throw to Leg Slash/Crippling Slash). It was also given to the tank classes. Here is a chart with the tanks and their debuffs, as well as healers and their buffs (see next section for descriptions). Along with the debuff changes came the new buff skills to try to equalize the classes with less raid utility. Sentinels maintain their Inspiration buff for +10% damage and healing, Gunslingers kept their defensive shield that gives -20% damage reduction, and Shadows’ now can have their healing-boosting puddle regardless of their spec. Guardians and Vanguards have their AoE taunt damage shields they can give to allies, and Vanguards have an additional debuff of Ranged and Melee Accuracy with Riot Gas. I hope this helps you to plan your raids and PvP ranked teams! Let me know if you notice any discrepancies or if you have any comments or feedback! Coded Message Easter Egg in SWTOR What do I feel! ?